The Carnevale di Venezia is a public festival in the Italian city of Venice. The Venetian Carnival is an international event becoming more and more important each year thanks to the participation of thousands of people who gather in the Venetian streets and squares. Carnevale was first celebrated in Venice in 1094. For two weeks public areas around Venice become the showcase for actors, acrobats and musicians with residents and visitors alike wearing elaborate masks and elegants costumes. Carnevale typically involves public celebrations, parades, and public street parties. People often dress up with costumes during the celebrations. Specifically masks in Venice where they originated. Today, approximately 3 million visitors come to Venice every year for Carnival. One of the most important events is the contest for la maschera più bella ("the most beautiful mask") takes place the last weekend of the Carnival and juried by a panel of international costume and fashion designers. The celebrations include performing arts, music, masquerade parades, and the traditional volo dell’angelo (flying angel), all in the unique setting of some of the ancient Venetian Palaces. It is not surprising that Carnevale is also associated with some traditional culinary delicacies, and it’s in this tradition that the Il Carnevale di Venezia wines were created. Veneto is a wine region in north-eastern Italy, one of a group of three highly productive Italian regions known collectively as the Venezie (after the ancient Venetian Republic). 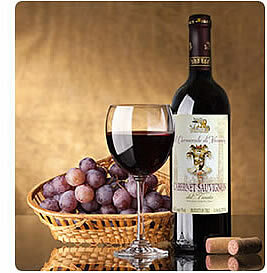 Veneto's growers are among the most modernized in Italy. 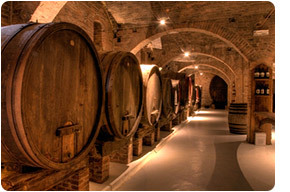 While most of the 'classic' wines from this area are based on native grape varieties like Garganega, high demand for Veneto wines in the European and US markets has galvanized the region's producers into experimentation with Cabernets, Chardonnay and Pinot varieties, among others. Chardonnay has a long history in Italy. By the late 20th century, more concentrated efforts were put into identifying Chardonnay and making pure varietal versions of the wine. By 2000, it was Italy's fourth most widely planted white wine grape. Most Chardonnay plantings are located in the northern wine regions, and in Veneto, it is often blended with Garganega to give more weight and structure to the wine.